Of course, this data caught my eye. My friend Gary Anderson posted it on Facebook with this link to the National Literacy Trust Findings from their Annual Literacy Survey 2016: Celebrating Reading for Enjoyment. I had just spent the day working with teachers in Clear Creek ISD as they launched their two week STAAR Academy, a series of summer school-like classes designed to immerse students in authentic reading and writing — not the typical mode of tutorials often offered in the hope of helping students pass their state mandated English exams. Billy Eastman, Clear Creek ISD High School ELA and World Languages Coordinator, is a visionary who believes in his teachers and in the students they serve. He knows that when students choose books they want to read, experience learning in an environment that validates their personal lives and learning journeys, and are given space and instruction that allows them to write about the topics that matter to them, students grow. They grow in confidence, and they grow in ability. Thirty-five teachers met with me in a two hour institute this morning. We read and talked and wrote and talked. We built a community of teacher-readers and writers. We engaged in learning — all with a central goal: How can we create a space for all students to advance as readers and writers? Then, teachers planned. In teams they designed lessons intent on engaging students as real readers and writers — not just students reading and writing for a test. After lunch, teachers facilitated similar community building activities with the roughly 250 students attending the academy. With generous funding by his district, Mr. Eastman was able to provide books, lots of new high-interest YA literature, in which students could choose a book they want to read. This is the first step in “celebrating reading for enjoyment” and all the benefits that come with it. As I visited the 12 classrooms this afternoon, I witnessed students writing and talking about their reading lives. “I’m not really into reading,” said another. “Reading isn’t my thing,” another boy said. I asked one young man if he liked to read, and he told me: “Yes, I read a lot.” He had just selected Scythe, the new book by Neil Shusterman, and I could tell he was eager to get started reading it. He’d already read Unwind and quickly told me how much he enjoyed that series. The other three students in this boy’s small group were less enthusiastic about reading anything, but they were willing to try. One chose Still Life with Tornado by A.S. King, another Boy 21 by Matthew Quick, and the other Out of Darkness by Ashley Hope Perez. The ratio of boys to girls in most every classroom was at least 4 to 1. Boys want to read books that look “tough.” The cover has to captivate them. Girls will choose books with male protagonists more often than boys will choose books with female protagonists. Few students choose historical fiction — they seem drawn to realistic fiction and dystopian. For the next nine weekdays, students will read their chosen books and spend time engaged in their community of learners. They will practice the moves of real readers and writers as teachers practice the routines of readers-writers workshop and read and write beside their students. Besides the obvious benefit for students, teachers will engage in the kind of professional development that truly matters, the kind that gives hands-on experience with students as they practice the art and craft of teaching. I am excited for the outcome. I am excited that teachers are excited. I am honored to be a part of Mr. Eastman’s vision for his district. So what does this have to do with the National Literacy Trusts’ Annual Survey? A lot. As I read through the report this evening, I found nothing startling or surprising. Of course, there are advantages to reading for enjoyment. But then I shifted my thinking and began questioning the why and the what. Why does the data say what it does? Why are their gaps in enjoyment between boys and girls? Why are their gaps between age groups? What is happening in schools that might be causing these gaps? What is happening in students’ lives that might be causing these gaps? What can change if we approach reading and writing instruction differently? What should change? I challenge you to read the report and ask yourself similar questions. Then, I challenge you to take the next step: follow Billy Eastman’s lead. Whatever your sphere of influence, how can you allow a space for reading for enjoyment? And if you haven’t done so yet: How can you change the model of instruction in your classroom, in your school, or in your district so all students have the chance to become real readers and writers who enjoy what they read and write? Don’t all students deserve similar opportunities to learn — not more test prep? Amy Rasmussen lives in north Texas and teaches AP English Language and English 4 (new prep in the fall). She loves talking books, daughters’ weddings (two this year), and grandbabies. She also loves facilitating PD for other teachers making the move into a workshop pedagogy because it keeps her focused on her own improvement. Amy adheres to the words of Emerson: “We aim above the mark to hit the mark,” and Jesus: “Love one another.” Imagine a world if we all aim higher. Follow Amy on Twitter @amyrass. And she’d love it if you follow this blog! 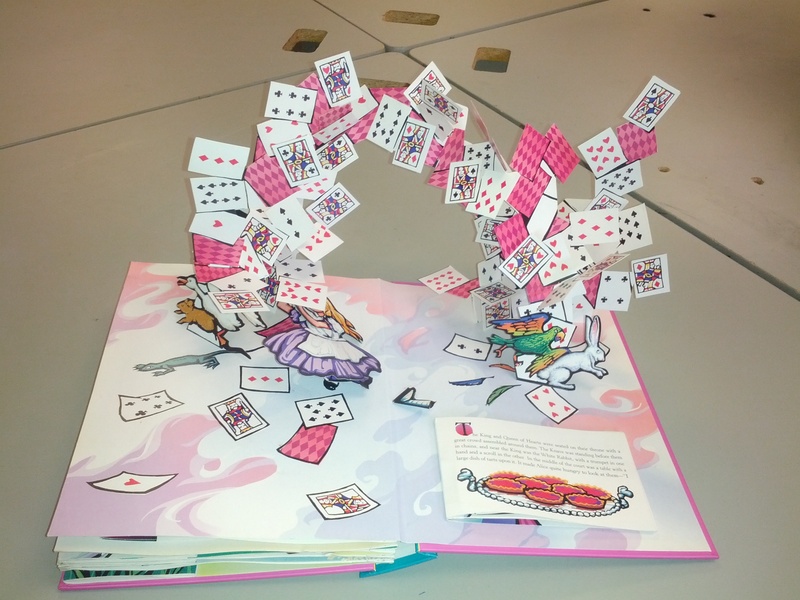 Alice in Wonderland pop-up book – full with rich colors, adventure, and 3D visuals. Last year, a colleague of mine was through the roof to hear about some of the children’s classics that my students were engaging in: E.B. White’s pieces, Peter Pan, The Secret Garden, The Tao of Pooh, Alice in Wonderland – which holds a very special place in her heart. But, for some reason students across the board have been guided away from these treasures. Why are we steering them away from the simplicity of tapping into their inner nostalgia, re-entering times in their lives where there was quiet innocence and a simplicity that innately dissipates as we mature? 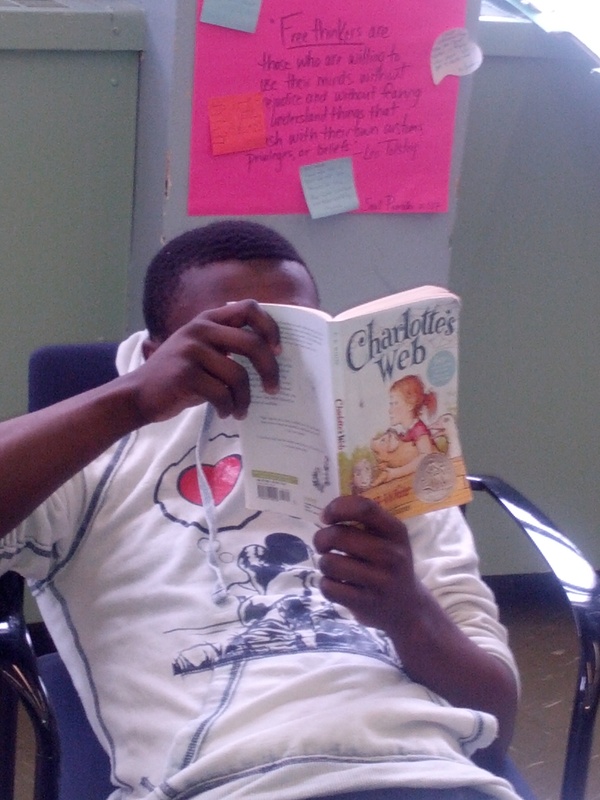 In between reading The Classroom and The Cell and I Am Malala, this young man enjoyed the layered themes of a charming classic. Charlotte’s Web was just as powerful for me as a thirty-something adult as it was as a seven-year-old little girl. The latter was an opportunity to finish a chapter book full with robust (animal) characters and an opportunity to connect with Fern, the moralist. The former was a rich experience as I explored the theme of love, relationships, sacrifice, and an understanding of death (as I had recently lost my grandmother). 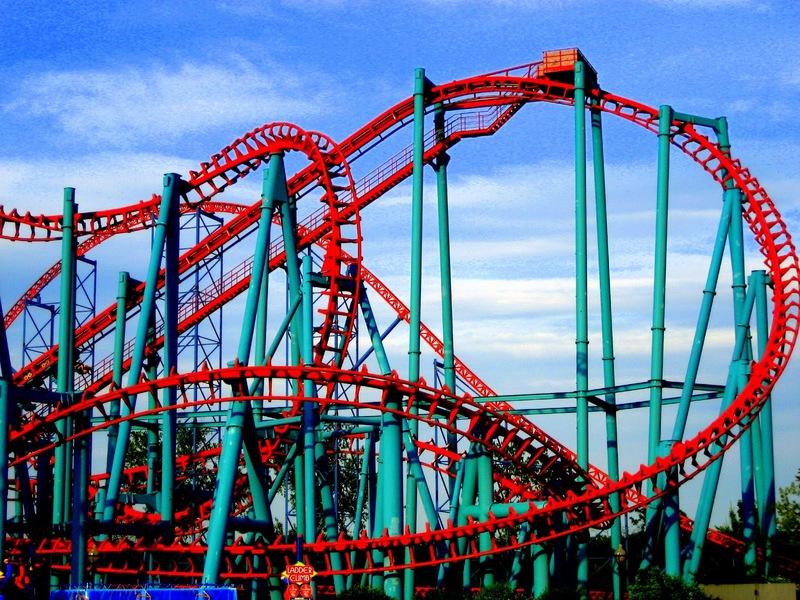 One of the important elements of the Readers Writers Workshop model is the idea of roller coaster reading. As Penny Kittle adequately puts it; adults read books on all different levels based on interest – students deserve the same. Think back to a time you dedicated your reading to a piece that was difficult – for you – for whatever reasons affiliated with that experience. Often times, we decide to ‘take it easy’ once we’ve conquered a book of that caliber. We’ll play with levels and genres and graphic novels and page numbers…and any other factors that play into our decision making. But, we typically veer from the intensity. Until we’re ready to try again. And, we typically are ready at some point because we experienced the pride that comes with such a challenge. It just may not be our next book…or the one after that… But, we will find ourselves back there because it’s important to do so. Students will too. Roller Coaster Reading : All readers should have the luxury to go on such a ride! And while there is the push for lexile reading, and all of the other ways to monitor student reading, we must let students read what their souls ache for. Whether it be luxuriating in a time of childhood innocence or challenging their vocabulary with a much more difficult piece. When we provide space for students to explore (and yes, children’s books included) students find the roller coaster that suits them – a bit of scare and intrigue balanced with comfort and adventure. A wonderful way to provide students the opportunity to monitor such reading is through the creation of a Reading Ladder. (Scroll down to Q1 and Q3 to find information on how to create ladders and see examples.) Simply, by reading various books on differing levels, students have the opportunity to review their learning, progress, fluency, and stamina…all the while having choice. This year, I intend to watch our I’ll Always Be A Kid shelf grow as more and more students find themselves drawn to some of the classics from their childhood. A handful of students love this shelf because they reminisce about reading (or having that book read to them) while others are exploring children’s literature for the first time. Our adolescent parents are intrigued as they scope for titles that they want to bring home to read to their own little ones – because passing on the gift of literacy is priceless. Regardless of the rationale, students end up falling in love with the magic. What hesitations or fears surface when thinking about high school students reading children’s literature? 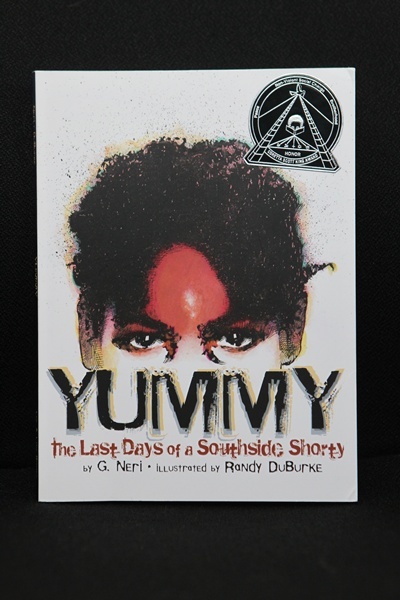 In this award-winning graphic novel, Robert “Yummy” Sandifer’s life becomes interwoven with other true events from a period in time where Chicago’s south side was running rampant with gang activity and violence. The year: 1994. Yet, its relevance still holds weight today in urban communities throughout our country. Unfortunately. Through third person narration, eleven year old Roger, guides us through the ongoings, thoughts, chaos, family ties, brotherhood, fears, ponderings, love, realities and insecurities most young adolescent males experience. Roger lives on Normal Street. He addresses what many readers are already thinking: But I guess “normal” is different to different folks. Additionally, the incredible illustrations allow us the luxury of experiencing Yummy’s journey through his eyes, Roger’s eyes, and the eyes of all of those that take part in the journey. This gritty exploration of Yummy’s life forces readers (of all ages) to question their own understandings of good and bad, right or wrong, yes vs. no. It provides us with the inner-workings of [the downfall of] self-worth and naturally asks us to question it. Ultimately, we are challenged to think on a macro level about society; why are so many of our youth feeling forced into a life where statistics are alarmingly glaring? Yummy is a piece that everyone needs to read. It’s important. It’s relevant. It affords us a window into the lives of so many of our youth. No wonder it has won just under 30 honors and awards. This is one piece of literature you cannot afford to miss. 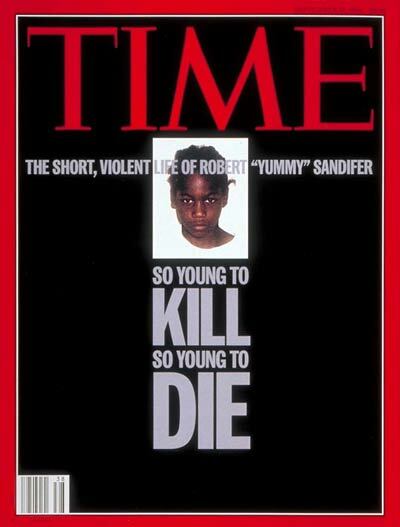 Here is the cover of TIME Magazine’s issue detailing the story of Robert “Yummy” Sandifer. Tragic and important. We live in a technical world. People rarely see one another face-to-face anymore, which is why writing has become our hypothetical suit-and-tie. To get a job, one uploads and sends a cover letter and resume. To apply to college, one submits a college essay. 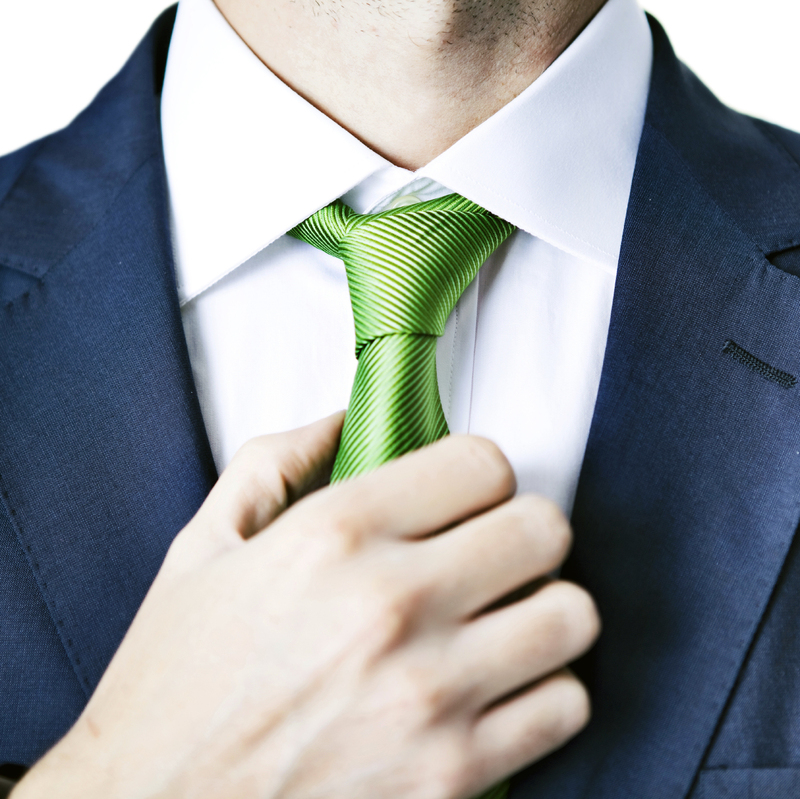 To correspond with a colleague, one sends an e-mail. To be engage in online discussions or to communicate on social media, one must post or blog or tweet or comment. More than ever before, we are our words. We live in an age where we can look and act like slobs behind the screen while our words tell a different story. It’s empowering and liberating but also terrifying. Terrifying because too often our students don’t understand the value of formality in writing. This has become even more apparent as I, a 26-year-old, am both exposed to and part of a generation of socially illiterate people. We, as well as our students, understand text language, chatting, posting, and tweeting, but our colloquial language seeps into our every day interactions, handicapping us in other ways. While students can effectively communicate with their peers, they have not received the training to engage in formal written conversations—the types of conversations that drive the academic and business world. In turn, students arrive in college lazily piecing together informal e-mails to their professors that poorly represent their abilities and knowledge. We assume that because they have grown up as Internet babies and that because they are constantly on their phones, they understand the unwritten rules of Internet writing, but they don’t. This year I have made it a point to inject the discussion of voice, formality, and audience into my reading and writing units in an attempt to widen my students’ understanding of and comfort with writing. In all of my classes I have sought to push my students outside of their comfort zones by exposing them to diverse mentor texts and assignments that force them to play with words. For many students, voice is a challenging concept. They struggle with finding a voice in their own writing, which makes it even more imperative students be exposed to comedic, sardonic, opinionated, and academic pieces. The only way to develop voice is to study it. Not all of the pieces I show my students are high brow; I pull from a variety of sources ranging from blog posts to articles from The Atlantic. But the pieces I choose are intended to show that a wide range of writers and voices exists. The more students understand that there is no one-size-fits-all structure, the sooner they will be willing to dabble in their sarcastic or silly side. In learning about voice, students must also understand the value in formality and audience in their writing. Too often the e-mails I receive from students look like a long rambling text message. We’ve all received them—the ones riddled with grammatical errors, making us cringe and wonder if they’ve learned anything this year! Teens quickly become comfortable with the fact that teachers are the only people reading their writing. Students become overly comfortable with teachers reading their writing at times. We’re seemingly safe and familiar; we know their quality of work. Exposing their writing to new eyes and ears increases the stakes and makes their work more relevant. This year, I was determined to push my lower level freshmen beyond the classroom and get them engaging with mentors. I could tell my students to work hard, which I did many times over, but in the general scheme of things, I was their teacher (akin to their mom). So I recruited a Navy Seal, an elementary school teacher, a forensic anthropologist, a photojournalist and others to do the job for me. Students were required to research a career. While they completed their research, I sat down with each student and helped him or her to draft an e-mail that they would send to a professional with which I paired them. Oftentimes I would return to find my students’ e-mails plagued with the same grammatical errors I’d seen so many times before, only this time, I was with them on the sending end. “I was taken aback when I saw that he is only in ninth grade; I have students much older who do not bother to write properly and it disappoints me. I am not your friend on FB nor are you texting me so no need for brevity at the expense of complete and correctly written sentences. Salutations? Maybe next year. Our students are going to college arguably without knowing or understanding the importance of voice, formality, and audience. To prepare them for life beyond high school, we must strive to incorporate real-life writing assignments into our classrooms. 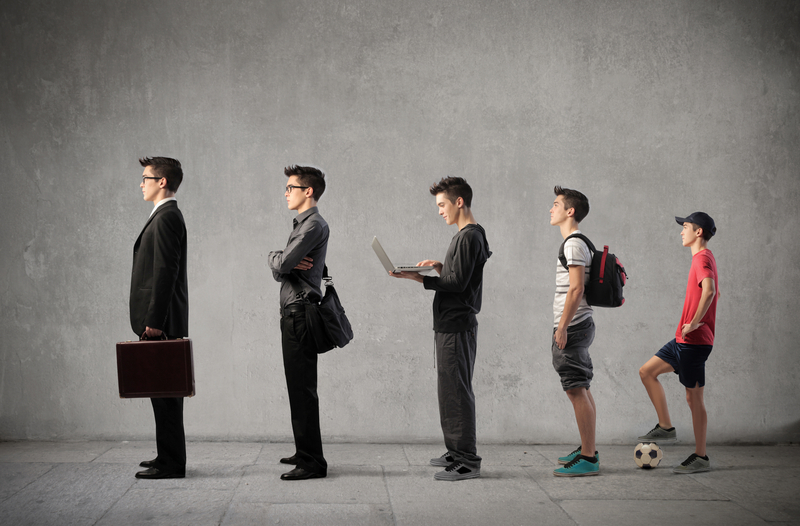 While some of my students may never write a research paper after they graduate from high school, I know that nearly all of them will use e-mail, apply for jobs, and engage on social media. My role as an educator is to help mold and train productive and intelligent citizens and while giving them lifelong skills that translate beyond the classroom. Part of this is continuing to develop and adapt my classroom to better fit the needs of 21st century students. So regardless of what my students do in their free time whether they enjoy lounging in sweatpants with a tub of Doritos or taking selfies in a bathroom mirror, I want them to sound like poised, intelligent, and confident individuals. I want the world to be open to them—both online and in real-life.